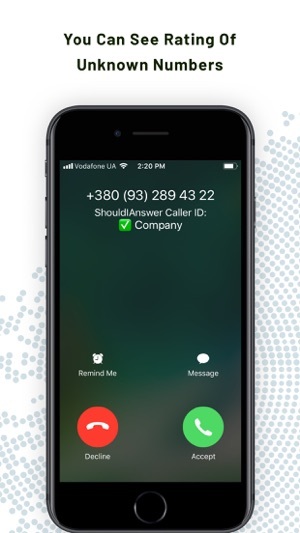 Get rid of all spam calls. For good. 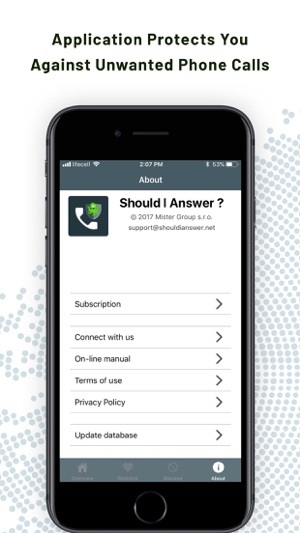 It has been more than 3 years since we released the Should I Answer app, which has been protecting you against all kind of spam calls. 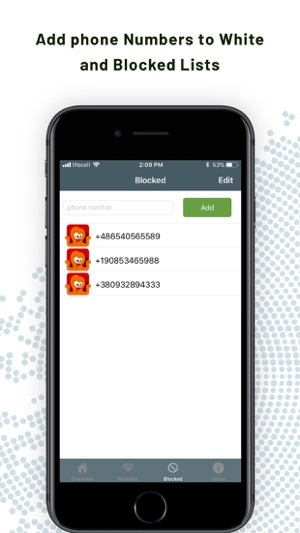 We have done a lot of work during this period: the app warns every day against 4 000 000 of spam calls, it blocks other 200 000 and saves average time of 63 000 seconds daily! But we didn’t take a break. So, finally, we’re really lucky to introduce you the new Should I Answer app for iOS. What are the app's functions? -> … and save your precious time. For who is this app meant to be? user-friendly and enables you to easily gain all the necessary information about incoming phone calls. What database do we use? Most of the numbers in the database were rated by our users from their own real experience (based on real calls), but we included ratings from Do Not Call Registry and Federal Communication Commision as well. The number of new reviews is about 30.000 a day! numbers stay always hidden in your phone, we never use them for public presentation or processing. We care only about new, unknown calls (and if we find out that someone has written a review for personal number, we work to delete it ASAP). Why is not this iOS app for free? We’ve been thinking about how to do this for a really long time. We want to offer you a full service including regular updates (so you can really count on the app). However, since there are no adverts in the app itself, we were thinking about how to secure financing our programmers’ time (because the growing database of numbers needs daily maintaining). Interested in more info? Just have a look on our webpage (you can find a lot of uselful information about telemarketing and phone scam there). Or connect with us on Facebook. Caller ID information, blocking of unwanted calls and daily database updates are available after purchasing 1 month auto-renewal subscription. There is 1 month trial period to test if the app fit your needs. A one time fee I’d consider if the app really worked? Tried searching my own number to see what I’d get for info? Had me living in the wrong state and with the wrong cellular company. Did show me as a neutral number, but with info being so wrong I got to ask myself if I’d be paying for real info or just something spit out to give me the impression it’s real info? Best way to check these apps is with a number you already know the answers too and see if the app comes up with the same answers or not? I don’t mind the subscription model, you get what you pay for. I wish the ui would allow searches by recent calls and I wish it would show incoming calls that have been blocked, as well as a way to easily and seamlessly report recent phone calls to the database without having to memorize and type in everything from scratch. I’m a paying customer and the whole point of that is to be offered convenience. If it is not convenient then why even subscribe? This app so far has been performing poorly. I am up-to-date on all my operating system and applications. I emailed Support and they promptly reply within one day which was great they gave me some ideas but basically what I had already done (this is why 2 stars instead of 1). At best one out of 20 calls or actually detected correctly and I need to go in and manually add these to the database for ShouldIAnswer. So far this has been a waste of my money. I hope it will start performing better but i have my doubts.